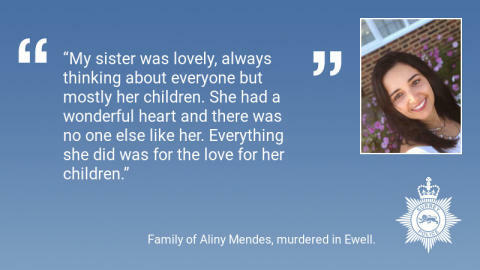 The family of a woman who was murdered in Ewell yesterday afternoon (8 February), have described her as a “caring sister” with a “wonderful heart”. Aliny Mendes, 39, died at the roadside shortly after police were called following reports that a woman had been stabbed at the Sparrow Farm Road junction of London Road. Two men were arrested in connection with the murder an hour and a half after it happened. A man in his 40s from Epsom was arrested on suspicion of murder and remains in custody. A man in his 50s from London who was arrested on suspicion of assisting an offender has been released with no further action being taken against him. The investigation remains ongoing. Officers are continuing to patrol Ewell and provide reassurance to the community. Detective Chief Inspector Mark Chapman said: “This was a tragic incident where sadly a woman lost her life as a result of the injuries she sustained. At this time we are not looking for anyone else in connection with this incident, and we do not believe anyone else was injured. The coroner has been informed. “The victim’s children are being provided with the support and immediate care they need at this difficult time. “We have carried out house to house enquiries and have already spoken to multiple witnesses who have come forward. If you witnessed the incident and have not already spoken to us, please come forward. I would also ask that anyone who was in the area and travelling in a vehicle with dash cam or helmet footage that you review it in case you have anything that can help us piece together a timeline of what led to this tragic death. “The incident took place during the day and is likely to have a traumatic effect on the people who witnessed the incident and the subsequent police activity. I would encourage anyone who has been affected by the incident to speak to someone they feel comfortable talking to, whether this is a friend, relative, or a medical professional, it is vital that you do not bottle up your feelings, it is ok to talk.